The aim of search engines like Google is to ensure to users can get to the best information available for the queries they search. The algorithms continue to tighten up to provide the best user experience possible, and the concept of user intent is right along those lines. User Intent — sometimes also called “search intent” — is taking into consideration not just the keywords entered into the search bar, but the nature of information about those keywords the user is after. It’s important for HVAC websites to offer up lots of quality content with user intent in mind to best serve their customer base and perform well in Google search rankings! 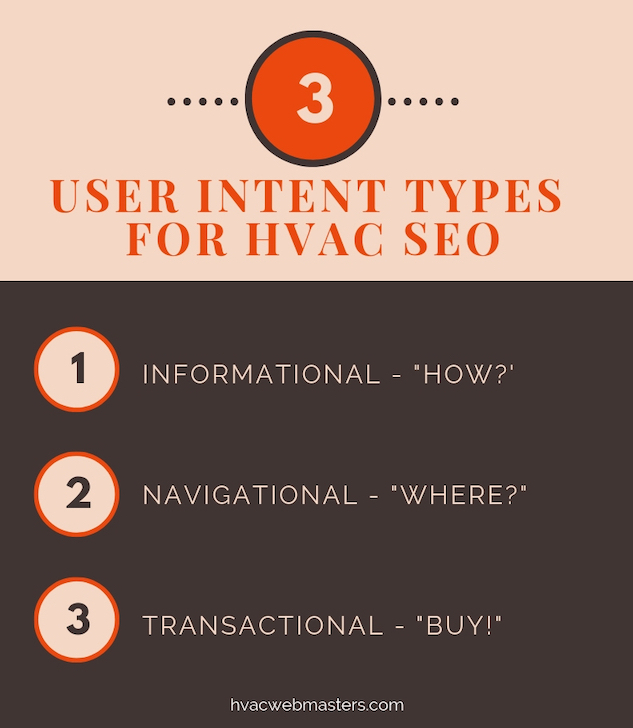 Let’s take a look at the main types of user intent for HVAC Google searches, and I’ll share some practical tips for ensuring that your internet marketing strategy is poised to optimize well. This is a prime user intent type when you (or the content writers you’ve hired, in most cases) are developing copy for your website, and dovetails beautifully with Content Marketing for heating and cooling services. If you’ve missed our recent blog posts, content marketing is copy that is written with the goal of informing your customer about a product or service, without pitching your specific company per se. It’s delivering value via content without explicitly advertising your brand. Answering the questions that potential customers would ask of an HVAC professional like yourself is a great way to not only anticipate the needs of folks looking for the services you offer, but will also help you rank better in the Google SERPs. Think about the types of questions you get calls about (or that your receptionist/office manager hears). Write specific webpages or blog posts to address those questions. They’re needs, after all, and you’re uniquely positioned as a subject-matter expert to address them as a service to your customers. The key here is utilize proper on-page SEO like optimized Title Tags and Header Tags so that search engines are aware of the great content you’re publishing, and can ensure you get prominent placement to get your phone ringing! This very post is an example of addressing a need for potential customers (that’s You) by publishing content (a blog post) which answers a common question that HVAC business owners ask of us (as SEO specialists). It’s not about whether or not you hire us to redesign your website and manage your content (although we’d love that, of course), but I want to provide value to YOU simply by sharing information to help you better navigate your buying decision on the SEO and Internet Marketing front. Let’s say this post really piqued your interest and you like the content you see on our website and blog. (Aw, you’re making us blush!) Your next step may be to research other Web Marketing companies, or to specifically research our firm to determine if you’re ready to make a call for more information. You would be the Navigational User Type at this point, because you’re beyond the research phase and now considering a particular “brand,” or at least trying to find that for your next move. Here’s another example: think about trying to locate a particular webpage for a company you know you’re ready to work with. You may not want to take the time to search for their homepage, and then navigate within the site to find the desired page. Instead, common user behavior is to simply Google the company name and what information you’re specifically trying to find. This lets Google (or whatever search engine you’re utilizing) do the work for you, so you can simply click on the link from the SERPs to get to the exact page you need to move forward in the process. This is navigational user intent. How Do I Create HVAC Content For Navigational Searches? Assume that the viewer has already made a decision to call an HVAC professional. So they’re beyond determining if they can DIY a fix, and know they need help. They are going to search for a particular service or company name (if known, but rare) and generally include the location. They’re still trying to hone in on who will get the call, so while a buying decision is imminent (we’ll talk more about this transactional stage in a moment), they’re still discovering information to help that decision along. Because it is unlikely that a potential customer will search for your particular business name off the bat (although this is a common step if they’re vetting your brand for the work, which is why a well-established web presence is important to make that decision easy for them), the best way to appeal to this user type is to ensure you have content on your website and social media pages that is targeted for your service area. It really won’t serve your business if you have a blog post, for example, that is killing it with traffic if you don’t get any calls as a result. By making sure to use your service cities (and county, depending on the population) as part of the HVAC keywords throughout your content writing, this will help the right customers stay engaged with your information and on the right track to booking your services! It’s important not to treat one user type as more valuable than all the others, as any potential HVAC lead could result in an awesome long-term relationship. Transactional searches are going to be focus on moving forward to book a service, in the case of heating and cooling repairs. You can (and should) absolutely cater to these queries, and offering content to differentiate you from local competitors is a great way to do so. A great way to appeal to the transactional user intent is to offer brand pages on your website. If a homeowner has a busted Trane air conditioner, for example, they may be searching for repairs or replacement by brand name. Having an optimized service page for Trane ACs in your area may get you the best placement possible to catch that call and get their business, which could potentially be a total system replacement. Cha-ching! Because there is potential business tied to each of the user intent types we just covered, it’s important to ensure that your HVAC internet marketing — from your primary website to social media and citation listing content — appeals to each user. It’s perfectly fine to market more heavily to one or some of the search intents, but making sure to have something available for everyone is a great way to ensure you’re not leaving potential business on the table. Service pages, which delve into deep content about a particular heating or cooling service, that are optimized for the service area and with a user intent in mind are going to help you get solid traffic and stand out from the pack. Especially in competitive markets, the key to succeeding online is offering specific webpages and blog posts that allow you to show up well in Google rankings and dominate early page SERPs. To make the most of on-page SEO, use a specific search query as the H1 for blog posts (which typically serve as the post title) or H2s for service pages. For example, write a blog post titled, “How Do I Know If My Furnace Can Be Repaired Or Needs To Be Replaced?” This is a logical search intent — Informational User Intent, to be precise — and will provide a great entry point for your website via this blog post (assuming it’s structured as an internal blog, versus a separate platform). You can use the Suggestion feature of Google to find additional topics for a nice breadth for content, all of which helps search engines see your site as relevant, valuable, and therefore deserving of top spots. 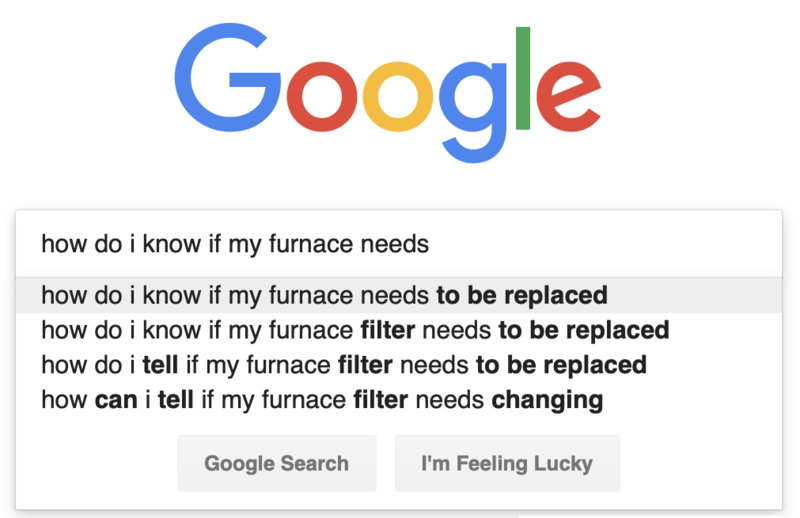 In the example above, Google seems to really like the keyword phrase “furnace filter needs to be replaced/changed.” This is a great idea for another post! If I proceed with the post title I just suggested (trying to determine repair or replacement), I may add the suggestion of a specific post or page about furnace filters to a list for future topics. Thanks, Google! What Would My Customer Want To Know? At the end of the day, you’re creating content for potential customers. Even if the idea isn’t explicitly to push your brand (which is honestly never really appealing to viewers), make sure you’re thinking like customers and using feedback you get via your team or Google reviews to serve clients before they even pick up the phone.